Real Estate In Carol Stream is a sellers' market with low inventory of homes in Carol Stream and a lot of buyer interest. There is a 4.6 months supply of inventory on the market in Carol Stream on May 31, 2018. BARRINGTON, Ill. - May 12, 2018 - PRLog -- Real Estate In Carol Stream (https://propertyup.com/realestate/carol+stream,illinois) is a sellers' market with low inventory of homes in Carol Stream (https://propertyup.com/sale/house-carol+stream,illinois) and a lot of buyer interest. 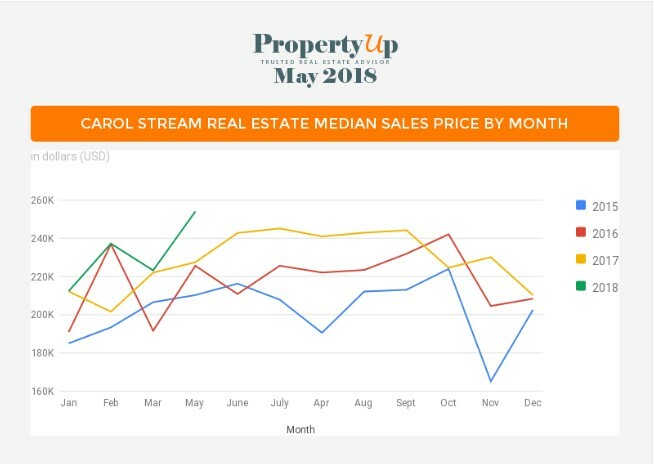 There is a 4.6 months supply of inventory on the market in Carol Stream (https://propertyup.com/sale/carol+stream,illinois) on May 31, 2018. The average market time for a Single Family Homes to sell in Carol Stream (https://propertyup.com/sale/house-carol+stream,illinois) last month was 26 days. It took on average 17 days to sell Carol Stream Condo (https://propertyup.com/sale/condos-carol+stream,illinois), Townhouse or a Duplex. The number of home sales in Carol Stream from April 1, 2018 through April 30, 2018 was 47 units. That is 1% above the number of homes sold last month in Carol Stream. The average price per square foot in the area is now $144/Sq.Ft, which is 14% an increase from last month. In Carol Stream there were 7 units sold in April in the price range between $111,000 – $182,518 with an average of 2.1 bedrooms and 1.3 bathrooms and average Square footage of 1,109SF. In Carol Stream there were 34 units sold in April in the price range between $182,519 – $345,017 with an average of 3.1 bedrooms and 1.9 bathrooms and average Square footage of 1,686SF. In Carol Stream there were 6 units sold in April in the price range between $345,018 – $436,000 with an average of 4 bedrooms and 2.6 bathrooms and average Square footage of 2,333SF. The low price range had the most activity. Homes up to $182,518 were on the market on average 26 days and sold an average of $139,928. If you are looking for a new home for you and your family, or looking for an investment property, you can't go wrong by getting a prime piece of real estate in Carol Stream (https://propertyup.com/realestate/carol+stream,illinois). Search all Carol Stream homes for Sale (https://propertyup.com/sale/carol+stream,illinois) on propertyup.com If you are considering viewing Carol Stream (https://propertyup.com/sale/carol+stream,illinois), you may want to do so now!